I'm still having a love affair with baking soda. I wash my face with baking soda every day, but I also use it as a deodorant, shampoo and household cleaner. I can't begin to say how happy this makes my inner minimalist. I'm saving so much money that I used to spend on expensive face products, "natural" deodorants, pricey "eco" house cleaners and fancy salon shampoos. Plus I don't have a gaggle of products under the sink or sprawled out on my bathroom counter anymore which is awesome. Now, I apologize now for the TMI - but stick with me, baking soda will change your life! Deodorant: When first I adopted a plant-based diet, I noticed my sweat wasn't as stinky. I would still get sweaty, but the body odor was noticeably less odorous. I was also living in a fairly cool tempered place so I stopped wearing it, especially in the winter. (I did put it on before exercise, however). I was using a generic "unscented" deodorant and due to my infrequent use, my deodorant stick lasted well over a year. By the time I needed a new one, the brand I'd bought was long discontinued so I bought the Tom's apricot one for sensitive skin. I broke out in a horrible rash almost immediately. After the rash cleared I tried it again and had the same reaction. (To be fair: Scott was able to use it without problems and liked it, but I am definitely allergic). This was the beginning to my very expensive quest to find deodorant. I must have spent $50 buying all different kinds of eco- and vegan deodorants, and when they didn't work, I put my tail between my legs and bought some of the more conventional ones. Nothing was working. Everything was giving me a reaction. Meanwhile, I was growing more and more self-conscious about having smelly armpits when I worked out or it was a hot summer day. My sister mentioned in passing that her friend used baking soda, maybe I could try that. WHAT?! Baking soda? But I was desperate... so, the next time I took a shower, I stepped out and used my hand to rub baking soda into my arm pits while they were still damp from the shower. I used my towel to lightly brush off the excess and that was it. IT WORKED. IT WORKED BETTER THAN ANYTHING I'VE EVER TRIED. Not only did my armpits stay dry and fresh the entire day, they felt clean. Previous deodorants also left marks on my clothes -- and baking soda never did. It was the best deodorant I ever found. I still use it and it still works amazing. I highly recommend you give it a try. Not too long after, my sister (yes, same sister) told me about baking soda as a cleaning agent. 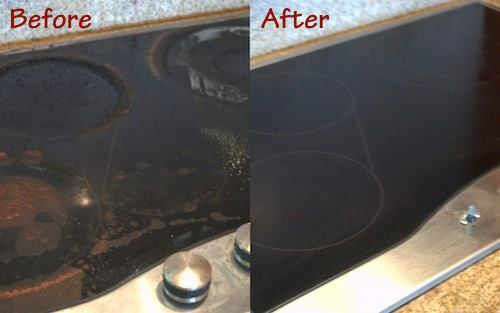 Every time I clean my stove, pots or bathroom with baking soda, I wonder why anyone ever uses harsh chemicals. Baking soda works so well and it's so green! I think the picture speaks for itself and I didn't even have to scrub! Finally, my hair. I'd heard about using baking soda and vinegar as a shampoo and conditioner, but because my hair was so long I was nervous to try it... until my hand was forced. One day I woke up and felt something sticky in my hair. I had no idea what it was or how it got there. I washed my hair, let it dry and it was still there. I washed it again, this time really getting the suds going, let it dry and STILL THERE. I knocked on my friend's door and asked to use her shampoo, and washed my hair again and yes... STILL THERE. I started to panic, then I thought, well, now or never and dumped baking soda into my wet hair. My hair felt like straw and I freaked out -- that's when I remembered my friend who uses baking soda as a shampoo said you also have to do a vinegar rinse, so being dramatic, I dumped half of the apple cider vinegar bottle on my head. Rinse, dry IT WAS GONE. And my hair felt incredible. I couldn't stop touching it. It was so soft and tamed. It was stunning. That's when I got into the regimen - 1 T baking soda + 1 cup water, followed by 1 T vinegar + 1 cup water. I'd stuck with it until I left for Europe, and then I fumbled and fell back into shampoo for travel ease. The water where I live now is "soft" so I'm still playing around with the proportions to get it right, but 1 T is a great place to start. Try it. You'll be glad you did!